Insurance provider Lincoln National announced yesterday its second-quarter dividend of $0.12 per share, the same rate it paid for the past two quarters after raising the payout 50%, from $0.08 per share. The board of directors said the quarterly dividend is payable on August 1 to the holders of record at the close of business on July 10. The board also called for the redemption of all of its outstanding $3.00 Series A cumulative convertible preferred stock on July 2 for $80 per security, plus any accrued and unpaid dividends. There are currently approximately 9,532 shares of Series A preferred stock issued and outstanding. Until the close of business on June 27, shareholders of the Series A preferred stock have the option to convert each share into 16 shares of Lincoln's common stock. The regular dividend payment equates to a $0.48-per-share annual dividend, yielding 1.4% based on the closing price of Lincoln National's stock on May 23. 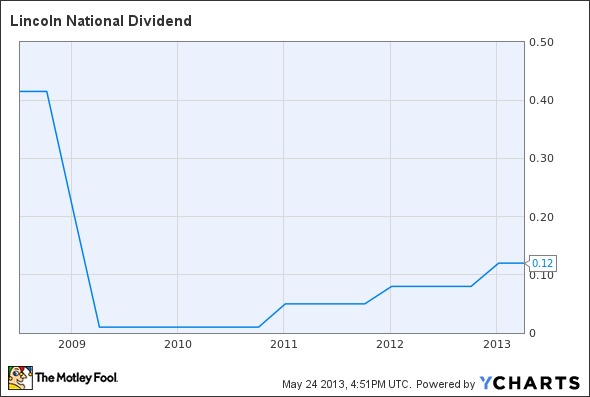 The article Lincoln National Keeps Dividend Steady at $0.12 originally appeared on Fool.com.